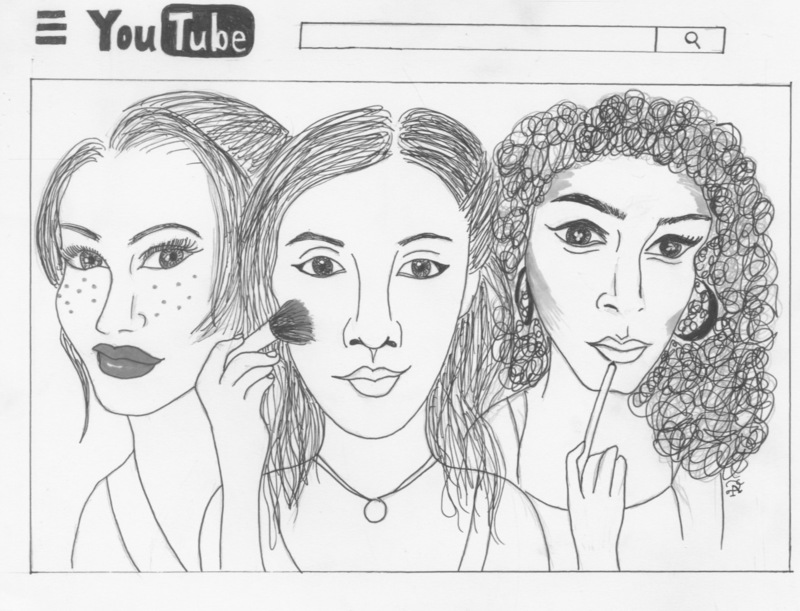 The culture of Youtube beauty gurus has exploded and surpasses the viewership of many forms of traditional media. These gurus are generally entrepreneurial women in their twenties trying to get in on the oversaturated beauty genre of new media. As role models in a platform that allows for greater diversity, they ideally offer the potential for expanding the concept of beauty, but also the potential to reinforce negative values from the beauty industry in a space where the audience tends to be especially vulnerable. Leading content creators, despite their limited diversity, appear to be attempting to change the culture of fashion and beauty to be about having fun and as expressions of self confidence, rather than making them the source of self esteem. The women who do stand out owe their fame in part to luck and good timing, but also because they were able to differentiate themselves through what they call “lifestyle vlogging.” What that means is that as much as the videos are about the quality of product reviews and tutorials, they build the fame of the beauty gurus around a cult of personality. Branding themselves as a friend or big sister who gives you beauty tips, relationship advice, and encouragement creates trust and loyalty within their fans. The success of this branding is evident in the amount of press these young women get. Ingrid Nilsen recently met with President Barack Obama to discuss issues important to her fan base; Zoella broke sale records with her new line of beauty products; Tanya Burr was on the cover of Glamour magazine; their meet and greets bring together young people from all over the world; and the list of high-profile achievements goes on and on. Given the influence of the beauty gurus, a lot of people are beginning to question what kind of impact they have on young girls. The beauty industry is notoriously toxic for young girls, given that their marketing strategy involves establishing insecurity by displaying unattainable standards of beauty as the norm. Photoshopped bikini bodies and poreless skin create a false need for diet pills and makeup, conflating beauty with success, self worth, and likeability. The world basically tells young girls that you have to look like Karlie Kloss to be worthy of relationships and friends, and if you don’t look like her, then you’d better start investing in products to make yourself look conventionally attractive. And while our media and society also promote ridiculous standards of masculinity as well, in general they aren’t specifically targeted by the beauty industry in the same way. Part of the industry’s marketing is creating a rigid gender divide that expects women to be more concerned about fixing their appearance. Growing concern of the effect this has on young girls’ self images has led to a slew of studies on media and self-objectification — the tendency for women to view themselves based on what others would see and be attracted to — which generally conclude that these influences are strongly correlated with depression, anxiety, and eating disorders. The problems with beauty, fashion, and diet industries are pretty well known and established, so the question that needs to be answered now is to what degree does the beauty guru culture subvert the more traditional culture of beauty. Where YouTube and other forms of new media appear to have power is in their democratic approach to media. Anyone can publish anything that they want, as long as they use a Taylor Swift song. And this illusion that anyone can make it as a YouTube star is interesting because on one hand it does allow, in theory, for greater diversity in terms of representation, but it can also be an illusion. In reality, the vast majority of the biggest beauty gurus are young, thin, white, cisgender, heterosexual women. So when you watch lifestyle advice or “A Day in My Life” on YouTube, what you get is repetition of a lifestyle that is predicated on being conventionally pretty and wealthy enough to buy organic foods and mountains of lip gloss. It means that if a person of color goes online to watch a haul video (videos where people show and tell about their recent shopping purchases), chances are they’ll be watching someone expound on the trendiness of “tribal prints” and kimonos. Tribal prints, by the way, generally refer to fabric prints inspired from South American designs, African fabric, and Indian woodblock printed fabric. The fascination with the Bohemian and ignorance of other cultures is concerning, and at times genuinely confusing, but it is a reflection of the way that fashion in the Western world is being marketed. Similarly, the values presented in boyfriend advice videos and workout tutorials and “What I Eat in a Day” videos display the same cultural expectations of normal that old media presented, just in a more personalized, and insidious, way. In general, these videos tend to be well intentioned, but it is concerning that there is a message that these videos are about real people keeping it real. People think the lives and values portrayed in these videos are the norm, when they are often unattainable. On the other hand, in comparison to traditional media, there is actually some diversity in the representation of beauty, gender expression, and health. Michelle Phan is probably the queen of beauty gurus, but in the traditional fashion and beauty industry she may not have been able to have her career because of her race. Estée Lalonde and SprinkleofGlitter (also known as Louise Pentland), for example, talk about their own struggles with body image while also showing their audiences that they love their body and feel good in it. Louise Pentland especially fills the need to talk about body image and beauty, as she has released a line of beautiful plus sized clothing and several fun, glamorous lookbooks to counter the perception that being plus sized should mean that you can’t be beautiful. SunKissAlba's channel talks about sustainability and organic products, but also describes a beauty regime that would be more specific to people of color. Kaushal Beauty makes makeup tutorials for both Indian and Western events, which is helpful because she uses colors that are more flattering on brown people. Ingrid Nilsen is a huge lifestyle vlogger who not only is biracial, but also publicly came out last year. This was huge for a lot of people because it was a way for a lot of people to see that identifying as a lesbian while also being feminine, fashionable, not white, beautiful, and ultimately the same person is okay and even normal. You see this a lot with new media representation of LGBTQA+ individuals; often the most powerful way of breaking down stereotypes and building self acceptance in marginalized groups is showing people just living their life and being happy. All of these YouTubers have huge audiences, and although it is generally not the case that people of marginalized groups have as large of a fan base, their ability to reach a lot of people with their identity is important. It is no less important that anyone can find small YouTubers who put out messages about diversity in self love and beauty that more or less align with their own identity — and that is something that is special about YouTube, vlogging, and specifically lifestyle videos. Beyond increased representation, what distinguishes the beauty guru platform from traditional media is how personal the content is. To a lot of young girls, these women are like big sisters or best friends who they ask for advice on fashion, boys, cooking, confidence, and how to be healthy. Whether you look at the love that came in response to Zoella’s videos about her panic disorder and managing anxiety, Ingrid Nilsen’s videos about periods, or Tanya Burr’s daily vlogs, you see these women building a really strong relationship with their fans. This turns out to be a really good thing because it allows these women to give advice on topics that are generally taboo or ignored, but are really important for young women to talk about. But while their popularity is built in part on their charisma and caring, their channels are also built on a trust for the products they use and review. And that’s actually how most of the beauty gurus make money — companies pay to have their products in their video. The top three beauty guru’s make an average of $33,000 a month. In a best case scenario, that means that these women will work out deals that will allow them to be paid to show only the products they actually want to recommend, and their audiences will be more loyal because of that. But the biggest issue people have with the beauty guru culture is the idea of these young fans who unquestioningly trust these women who are on some level making videos to advertise for a variety of brands. With that kind of adoration and influence, there is a possibility that they are teaching young girls consumerism and superficiality. These videos are a replacement for fashion magazines, and it’s questionable whether young women take away a different message. The increased representation does mean that there are certain messages —especially about what a woman’s body should look like — that become less popularized. But these videos are still supporting consumerism in an idyllic setting, with twinkly lights and floral bedspreads. A lifestyle vlogger, in theory, should also be talking about fiscal responsibility, sustainability, and what a relationship with material possession should look like as well as what a makeup routine and outfit should be. In the same way that a lot of white beauty bloggers disregard the roots of the clothing they wear and the cultural context of their outfits, a lot of these women are not considering the environmental impact or ethical responsibility of the clothing they buy. Considering that most drugstore brands test on animals, and many factories that make the hot new thing in fashion barely pay their employees, it is hard to separate the problems from the potential good these beauty bloggers can do. There is also the question of what this teaches people who may not feel conventionally attractive, but also don’t have the money to buy beauty products and new clothes. It does appear to tell people that you can be confident, and having all this stuff is a really easy way to feel good about yourself. Telling people to buy products — even if they are actually good — for the advertising dollars just seems like an oversight on the part of YouTubers of the culture that they are creating. Hauls, for example, are a particularly controversial form of lifestyle vlog. In hauls, users go shopping and earn a few million views showing everyone what they bought for themselves. And when successful YouTubers get paid to do haul promotions or advertorials, it can come across as showing off or narcissistic or, at the very least, far removed from most people’s financial reality. Depending on the way a channel is branded, haul videos can frankly appear shallow. It is important to not need to be validated by what you own and how you look, and that’s sometimes difficult because these things are tied in with likeability and social status. What’s most important here is that we keep having conversations about how we view makeup and fashion’s role in society. In feminist circles, the question remains: can makeup and fashion be empowering? Is there something negative in cultivating a love for sparkly eyeshadows and flowy dresses? It is worth noting that the idea of cultivating a love for beauty products out of self love rather than insecurity is hugely important, and a wonderful side effect of beauty guru culture on YouTube. You’d be hard pressed to find a lifestyle vlogger that hasn’t talked about self confidence, body image, or how makeup is more decoration than substance. In most cases, these videos are actually about how women appropriate something that might be seen as oppressive as a way to express themselves and make themselves feel good, regardless of what that boy or anyone else thinks. If young girls and women are modeling their lifestyles after what is presented in their videos, the hope is that they pick up these messages as well. The genre is new and open enough that people are talking about these things, about living with less and what life is outside of the framework of beauty. If the last few years of YouTube culture have shown us anything, it’s that a smart, thoughtful content creator is more than the brands they work for or promote. It may not be obvious to a casual viewer or to someone who isn’t part of the beauty guru audience, but ultimately what sells is this relationship they have with their viewers who look up to them, but also hold them accountable. On the one hand, the toxicity of the beauty industry didn’t magically disappear because Zoella went on camera and went through her day without makeup. On the other, though, there is now this experience where girls process breakups by watching Kayley Melissa’s tutorials and braiding each other’s hair, wind down from a long work day by watching pamper routines, or just feel a little more validated in their own expressions of beauty.